I-PAN project will be presented during the conference “Carbon Wood Storage? 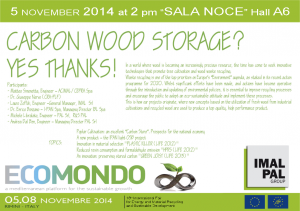 Yes Thanks!” to ECOMONDO, the 18th International Trade Fair of Material & Energy Recovery and Sustainable Development, which will be held in Rimini (Italy) from 5th to 8th November 2014. I-PAN will be explained by the Project Coordinator Ing. Lauro Zoffoli and Dr. Enrico Bonzano from IBL. Join in everybody!